For many years now, I have wanted to conduct an inventory of the stones and locate their present location through a field survey. Finally, in the spring of 1993 with the help of my Father, Gary Babcock, my brother Scott, Shirley Harkness, and Scott's new wife Joann, we set about to complete what has turned out to be a very timely project. Through research at the Bradford County Historical Society, I discovered that previous inventories were conducted in 1978 by a Mr. and Mrs. Radwanshi, and in 1979 by Edna Foster Watson and Ellen R. Glueck. A comparison of our 1993 inventory with the aforementioned inventories showed that a significant amount of deterioration has occurred in the last 15 years. Many of the stone which apparently were easily transcribed in 1978/79 were nearly illegible to us in 1993. It is my belief that much of the deterioration can be attributed to acid rain. (Through my involvement with the Mason and Dixon Line, I have found a similar rate of deterioration of the monuments set to mark the Pennsylvania and Maryland border in 1763-1767). When we conducted this inventory, my wife Sally and I were expecting our first child. At this writing our son Craig is now nearly 6 months old and I am moved in a way I could never have imagined by the inscriptions on the stones of parents who lost their children when they were only days or months old. Some parents like Willam and Elizabeth Huggans (# 29) lost several children that never reached the age of one. Some of the inscriptions were truly moving. The marker for Jonnah Clennen, who died September 7, 1887, at the age of 9 years reads "Budded on Earth to bloom in Heaven". This is one of my personal favorites since it shows that despite her parents pain and anguish, they were confident that she had gone to a better place. Many of the stones were a means of telling a part of the persons life i.e. "John Kitchen.. Was killed in the mines" or like many it told of their homeland "Miles McNally... Westport Co. Mayo Ireland". It is hard to imagine as you stand in the middle of this desolate cemetery that at one time not so long ago, it was surrounded by a bustling town of 2,000 - 3,000 hardworking miners, mothers, storekeepers, teachers and children all trying to build a better life for themselves, many in a new land. In November of this year, my brother Scott and I searched on the east side of the road across from the cemetery for some old foundations which I had found some years ago and found many old foundations, barrel rings, bottles, and even a broken crock that was made in Binghampton, NY. I had to wonder how many hunters walk these grounds each November and December and never realize that there was ever a town here with a population nearly the same size as my hometown Athens is in the present day. I have come to find through this project that there is a persistent interest in "Old Barclay" and it continues to hold magic for those of us whose Grandfathers tell us of their Grandfathers taking them hunting on the mountain or of the trips to the old "Picnic Grounds". I came across a letter from the 1930's that spoke of the recent Barclay reunion and of how the cemetery had fallen into disrepair and that there was currently a move under way to fix it up. I have no way of knowing how many others out there hold an interest in Barclay as it existed in the late 1800's but I am sure that I will cross paths with some of them in the future. It is possible that this will be the last inventory that will ever be conducted of this cemetery. I can not know for sure. But one thing is certain, with the compilation of our inventory and the 1978/79 inventories, it will be the most complete. In the future the only thing that will be needed to relocate the position of the stones will be a Professional Land Surveyor, a copy of the inventory, and a list of the coordinate values included with this inventory. A copy of this inventory will be presented to the Bradford County Historical Society for the use of the general public. I hope that the reader takes an interest in this important part of Bradford County's history and will pass down their knowledge to their children and grandchildren as my grandfather has taught me and as I will teach Craig. The following is a comparison list of the 1978, 1979 and 1993 inventories. The 1978 inventory was prepared by a Mr. And Mrs. Radwanshi. The 1979 inventory was prepared by Edna Foster Watson and Ellen R. Glueck. The 1993 inventory was prepared by Todd, Scott, Gary and Joann Babcock. This listing will show the stones that are not common to the three inventories. Since the 1979 inventory was prepared in the order in which they were observed in the Cemetery, a cross reference to the 1993 inventory should give a good indication as to the original location. 11 Willaim __ety " "
Small stone engraved "J R D"
- The stone is weathering and it is difficult to read the inscription. - The base is settling leaving the upper portion in danger of falling. Small broken stone adjacent engraved "M.C." - The bottom portion of the stone is broken off and the stone is not in a base. - The headstone and adjacent footstone are leaning against a small 6" tree. - The stone is broken in two slightly above the middle and is lying flat on the ground. Small native stone that may mark a gravesite. There are no apparent markings. - The top right corner and the lower left corner are broken off and could not be found. 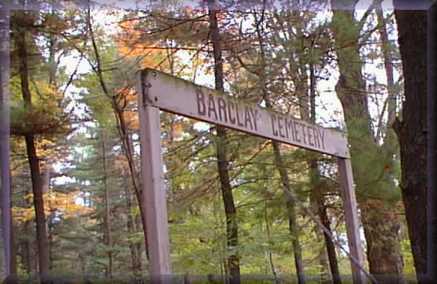 - The stone faces the rear of the cemetery and is leaning against a 15' - 18" pine. - Not shown in the 1978 or 1979 inventories. There appears to be a dove engraved at the top. The stone is broken and can't be read. _____ for of su___s __e Kingdom of Heaven. - There appears to be a lamb engraved at the top and the stone is broken in half. 12 - Footstone engraved "J.J."
13 - Footstone engraved "T.H." - The top 1/3 of the stone is missing however the bottom 2/3 rests firmly on the base. - the footstone # 13 does not appear to go with this headstone. - inscription reads "Mary Ellen". - it does not appear from the photo that this the top 1/3 of stone # 12/13. This could be verified by trying to fit it in the field. - The top portion of the stone is broken. - The stone has no base and is leaning against a fallen log. - The base has settled and the upper portion is propped up by what appears to be another marker. - There is a small rod in the top of the monument which held another section which is now missing. - The base is engraved "WALKER"
- The stone is in excellent condition and sits firmly on the base. - A poem is engraved on another side, however, it has not as yet been transcribed. - The stone is in good condition and firmly set upon its base. - The stone is out of the ground and leaning against a log. - Could be for Hannah Schriner, Stone # 19. - The stone is in good condition and firmly upon its base. It is likely that this stone goes with stone # 21. - The stone is out of the ground and leaning against a 6" pine tree. Family plot with main stone engraved on two sides. She fought the fight the Moon in heaven. Small footstone off to the side "T P"
- This is a fenced plot. The fence and the stones are in excellent condition. The gate on the fence still works if you remove the leaves and needles at the bottom. Aged 35 years & 5 Mos. best in thy sav____ joy. Aged 1 year (9) mos. Footstones: "J.H. ", "J.W.W. ", "J.H. ", "B.H. ", "J.H." - The stones and surrounding fence are in excellent condition. The gate to the fence is in fine working order after removing the leaf litter at the bottom. 1 large marker inscribed on three sides with 6 additional small markers. - The main stone is in excellent condition, however it is disassembled and should be put back together. - This plot consists of a deteriorated fence with no visible stones within. - Footstone engraved "A K"
- The marker is broken in four pieces with a portion still in the base. - 3 bases with markers, 1 marker, and 4 footstones. "M D", "J R", "G J J", "M J", "G J"
(The stone for charles was not found in the 1993 inventory. to bloom in Heaven to come unto me arms of Jesus. Children of Thomas and Mary E.
- Lambs are engraved above the childrens inscription. - This stone is off the base. The base must be reset and the top replaced. - Footstone adjacent inscribed "J.M.S"
- Small stone on the west with a lamb engraved at the top. - There is an unmarked stone broken and lying on the ground adjacent to this stone. - There are no stones but there are three and possibly 4 mounds at this site. The mound to the east has what may be a fieldstone or a broken headstone. A stone leaning against an 18" tree engraved "E.D." You are the visitor since the counter was installed on November 12, 1998.